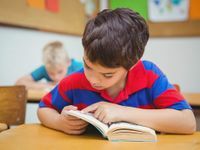 From Reading Month in March to year-long reading incentive programs, it’s common practice in the U.S. to give students prizes such as stickers, bracelets, and fast food coupons for reading. What’s the problem? Unless these prizes are directly related to reading (e.g., books), this practice actually makes students less likely to choose reading as an activity in the future (Marinak & Gambrell, 2008). It undermines reading motivation. Opportunities to interact with peers around books, teacher “book blessings,” special places to read, and many other strategies are much more likely to foster long-term reading motivation (Marinak & Gambrell, 2016). You’ve all seen it—students who got the words right on Friday misspell those same words in their writing the following Monday! Research suggests that the whole-class weekly spelling test is much less effective than an approach in which different students have different sets of words depending on their stage of spelling development, and emphasis is placed on analyzing and using the words rather than taking a test on them (see Palmer & Invernizzi, 2015 for a review). There is a considerable body of research linking physical activity to academic learning. For example, one action research study found that recess breaks before or after academic lessons led to students being more on task (Fagerstrom & Mahoney, 2006). Students with ADHD experience reduced symptoms when they engage in physical exercise (Pontifex et al., 2012)—and these students are probably among the most likely to have their recess taken away. There are alternatives to taking away recess that are much more effective and don’t run the risk of reducing students’ attention to important literacy instruction (Cassetta & Sawyer, 2013). Whether or not you engage in these specific activities, they provide a sense that there are opportunities to make better use of instructional time in U.S. schools. I encourage you to scrutinize your use of instructional time minute by minute. If a practice is used because we’ve always done it that way or because parents expect it, it’s especially worthy of a hard look. At the same time, if a practice consistently gets results in an efficient and engaging way, protect it at all costs. Together we can rid U.S. classrooms of what does not work. Bos, C.S. & Anders, P.L. (1990). Effects of interactive vocabulary instruction on the vocabulary learning and reading comprehension of junior-high learning-disabled students. Learning Disability Quarterly, 13, 31-42. Fagerstrom, T. & Mahoney, K. (2006). Give me a break! Can strategic recess scheduling increase on-task behaviour for first graders? Ontario Action Researcher, 9(2). Kamil, M.L. (2008). How to get recreational reading to increase reading achievement. In 57th Yearbook of the National Reading Conference, 31-40. Oak Creek, WI: National Reading Conference. Pontifex, M.B., Saliba, B.J., Raine, L.B., Picchietti, D.L., & Hillman, C.H. (2012). Exercise improves behavioral, neurocognitive, and scholastic performance in children with Attention-Deficit/Hyperactivity Disorder. The Journal of Pediatrics, 162(3), 543-551. Reutzel, D.R., Fawson, P., & Smith, J. (2008). Reconsidering silent sustained reading: An exploratory study of scaffolded silent reading. Journal of Educational Research, 102, 37-50.